# DIXDL32 - Double Bolt Clamp - Without Saddles - 2-20/64 in. to 2-40/64 in. # DIXDL32 - Double Bolt Clamp - Without Saddles - 2-20/64 in. to 2-40/64 in. Torque in ft. lbs. 40 A rugged, plated iron two-bolt clamp with machine bolts and hex nuts. Inner surface has dual gripping ridges. 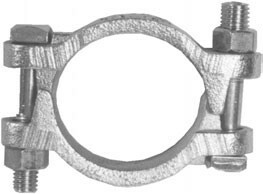 Bolt lugs are reinforced to prevent bending out of alignment. Measure hose OD accurately before ordering clamps. Torque values for clamps are based on dry bolts. The use of lubricant on bolts will adversely affect clamp performance. Consult Hosexpress when using double bolt clamps on helical wire hose. Hose Range 2-20/64 in. to 2-40/64 in.